for $1,297,500 with 3 bedrooms and 3 full baths, 1 half bath. This 3,883 square foot home was built in 1968 on a lot size of 26.00 Acre(s). 5 LOT SUBDIVISION - this 26 acre parcel offers 5 waterfront lots including the 3800+ square foot Mid Century Modern single level home. 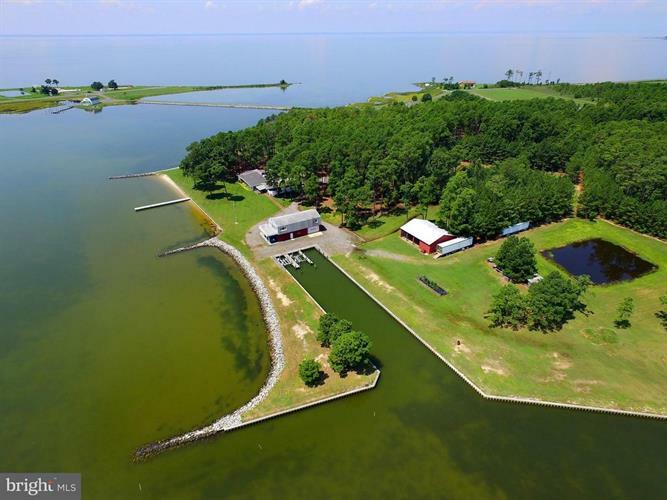 Unparalleled southerly broad water views plus close proximity to the Chesapeake Bay. Protected 50'x250' boat harbor with lifts, electric and water to safely dock all the boats, jets skis and toys. This private estate includes 30'x60' Barn/Workshop with full unfinished 2nd floor ideal for guest apartment. There's also pole building for your other equipment and toys. Open Floor Plan home offers enormous great room to enjoy the water in a comfortable every day lifestyle. Well appointed kitchen including wet bar opens to Family and Dining Rooms and gives the ability to entertain with friends and family. The dual sided fireplace is enjoyed from both the Great Room and Living Room. Large master suite offers his/hers private bathrooms, large walk-in closet, and cedar lined closet plus private waterside patio. This home offers vast storage areas and ideal spots for hobbies/crafts. Open floor plan with single level living offers handicap accessibility. Beautiful mature pine trees, ponds, and over 2, 000 feet of protected shoreline are suitable for hunting. At the convergence of Brooks Creek, Little Choptank River, and the Chesapeake Bay this location is ideal for boating, fishing, crabbing, and water sports.